It started when I began volunteering my Saturdays. It progressed when I got excited about giving up entire Saturdays. The feeling seemed all too familiar, but new. A laser-like focus, inexhaustible, melting hours away as if they were minutes. A flush of excitement came to my face whenever ice core records were mentioned. I get that feeling when I’m teaching the science of climate change. Teaching children about the ocean. Photo courtesy of the author. I didn’t magically wake up one morning and realize this was my passion. I realized it at 3:06 PM on a Saturday while listening to a University of Miami climate scientist explain the biogeochemical processes of ocean acidification. This was supposed to be my day off. Why was I here? Why was it transporting me so? This page will give you some of the background on why this action is important. We’ll fill you in on what is causing the sea to rise, how it is likely to rise over time, and why it matters to us in San Diego. The problem is that the water level in the channels needs to stay a certain distance above sea level, to keep out the salt water that tries to push its way in from the Bay [18,20]. 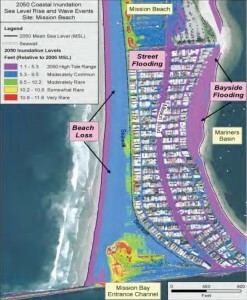 Yet, the reclaimed ground between the channels has sunk as much as 15 feet below sea level . The water in the system is precariously kept above sea level by 1100 miles of aging levees. 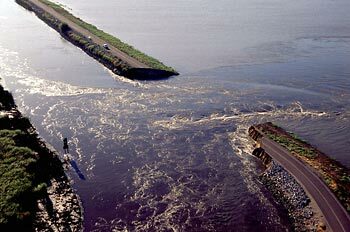 If those levees break at the wrong place, the water in the channels will drop, sea water will flood into the channels from the Bay, and the water supply for 25 million Californians  will be ruined for weeks or months . As the sea rises, the water level in the Delta, and the pressure on those rotting levees, must increase. 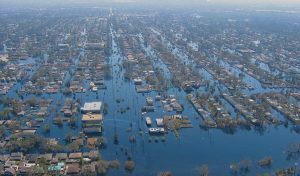 Sea-level rise is thus one of several factors that are making this vital water system unsustainable [18,20]. Thanks to George for his hard work researching sea-level rise, and to Bonnie for her thoughtful critique. This text is used here by permission of the author, and is licensed under a Creative Commons Attribution-NonCommercial-ShareAlike 3.0 Unported License. 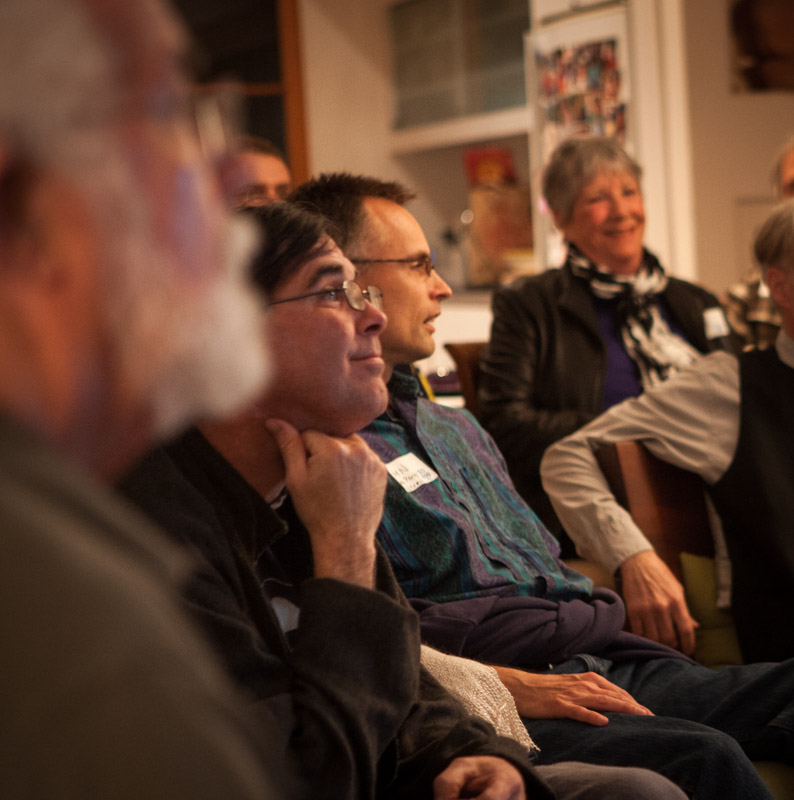 In San Diego, if you want to get involved in a spirited and informed discussion about addressing climate change, a Climate Chat sponsored by SD350.org is the place you will find it. On the first Thursday evening of March, four members of OSIP returned from their recent experience at the Warsaw COP with concerns that give us at SD350.org even more reason to commit to our own mission, combating climate change. Walking into the large open room of downtown’s World Resources Simulation Center, one sees a series of video screens encircling the room. On the screens are photos of three young Scripps ocean scientists, Yassir Eddebbar, Natalya Gallo and Lauren Linsmayer, taken with Christina Higuera, chairperson of the UNFCC COP in Warsaw. Later these screens will feature a lively video of two other OSIP delegates, the media team of Nick Obradovich and Kate Furby, making themselves comfortable on beanbags while they strategize their next move: how to poll the delegates to find out what they actually know about ocean science. It turns out most know very little. More on that later. It would be hard to find a brighter and more energized group of young people anywhere than these members of OSIP. How they found time, amidst work on their PhDs, to organize themselves as a delegation to COP and then as a panel to field questions at an open forum about the effect of climate change on the oceans is a testament to their commitment to inform the public about current ocean science. This evening, four of them are here: three Scripps Institution of Oceanography (SIO) scientists, Natalya, Yassir, and pilot-whale researcher Amy van Cise, along with Nick, who is a UCSD political science graduate student. Before the evening is over, they have convinced this audience that they know their science and, furthermore, they understand the diplomatic and political obstacles facing those who would save the oceans. When the forum closes, the four stay to answer the questions that keep coming. This is the third Climate Chat sponsored by SD350.org and it has attracted a good audience. Those of us who arrived early have seats on comfortable stools at high tables with computers in this high energy, high tech venue. Those who arrive later find places around the room in office space and on assorted chairs and couches. It’s a full house. After brief introductions, a call for questions from the floor draws out some daunting obstacles facing any effort to protect the oceans. An energized discussion of them ensues. For these graduate students, primary among those obstacles is that scientists who do research and understand what’s happening cannot themselves advocate for ocean-friendly policies. If they do, they stand to lose credibility, for both themselves and their disciplines. For most scientists, especially young ones who are establishing their reputations, that’s not a risk worth taking. They need others – like us at SD350.org – to advocate for the oceans as a significant aspect of our combating-climate-change mission. In response to a question about the efficacy of COP itself, Yassir brings up a knotty diplomatic problem: No nation owns the oceans, so who bears the responsibility for caring for them? It will take international cooperation, which in turn will require political will from the politicians of COP member nations. With many nations looking to the US, the world’s largest economy, for world leadership, progress in forging international commitment to reducing CO2 is currently doubtful. The money that turns the wheels of our political system, so much of it coming from the fossil fuel industry, makes it difficult even for those politicians who see the need to act now. That brings attention to another, related obstacle: the lack of urgency among the general public, who haven’t personally felt the consequences of climate change. This complacency prevents politicians from having the confidence to take action, even if they understand that climate change is real and that human beings are causing most of it. Without this populist counterbalance to the money poured into their campaigns from the oil industry, politicians are unlikely to stand up for pro-planet policies that defy their major political contributors. Again, that’s where we at SD350.org come into the picture. We must work to engender the political urgency needed for positive action. Despite the gloomy political picture, the ocean-science panelists found something positive while in Warsaw: They perceived among the delegates to the conference a hunger for information about the oceans. Two Scripps scientists – one of them, Natalya Gallo of this evening’s panel – earned venues to present their science at the Warsaw conference. 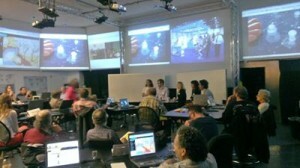 Their presentations had standing-room-only audiences – a heartening sight to the scientists. The evidence of such interest in ocean science, plus the energy and commitment of these ocean scientists, makes it obvious that they should continue their efforts. They should go to the Lima COP later this year with their skills at communicating the data of ocean science; then continue on to Paris in 2015, where a new treaty will be drafted, this time with more specific language relating to the oceans — likely thanks in large measure to their efforts. Meanwhile, it is our job at SD350.org, informed by the latest ocean science, to carry the message of the oceans into the political arena, where we will work on the seemingly intractable problem of generating the political will to combat climate change. This Climate Chat was, in a way, a passing of the torch from OSIP to us. Those of us who enjoyed and learned from the Climate Chat owe much thanks to SD350.org’s Dr. Janina Moretti for her hard work in bringing this successful event to fruition and to SIO for putting SD350.org in touch with OSIP. This text by Bonnie Mosse Funk is used here by permission of the author, and is licensed under a Creative Commons Attribution-NonCommercial-ShareAlike 3.0 Unported License. As a middle-aged scientist who wishes our society would make decisions based on reality, I get di scouraged watching middle-aged politicians play power games while we keep burning coal and oil, pumping heat-trapping carbon into the atmosphere, and hurting our children. Sometimes, the only hope I can see is that younger people do seem to get the need to stop abusing our planet. Two weeks ago, with my San Diego 350 colleagues Bonnie and Janina, I got to meet some young scientists who really do give me hope. As of my last post, these Scripps Oceanography and University of California scientists were headed to the world climate summit in Warsaw to make the politicians there a little less ignorant of what climate change is doing to our oceans. They aimed high. At the conference, they gave two formal presentations, spoke with delegates from 70% of the countries represented and brought their messag e to top policy makers including the executive secretary of the United Nations body that governs the yearly climate negotiations. 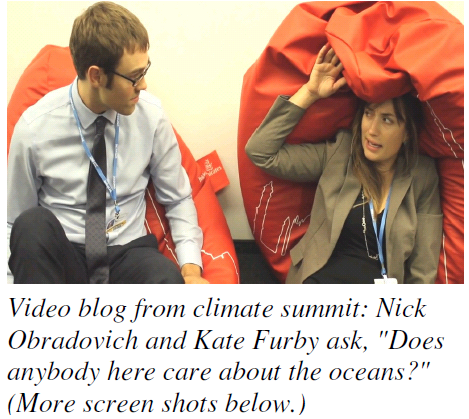 Now, they’ve brought the climate summit back to San Diego, with a series of video and text blogs that you ought to see. 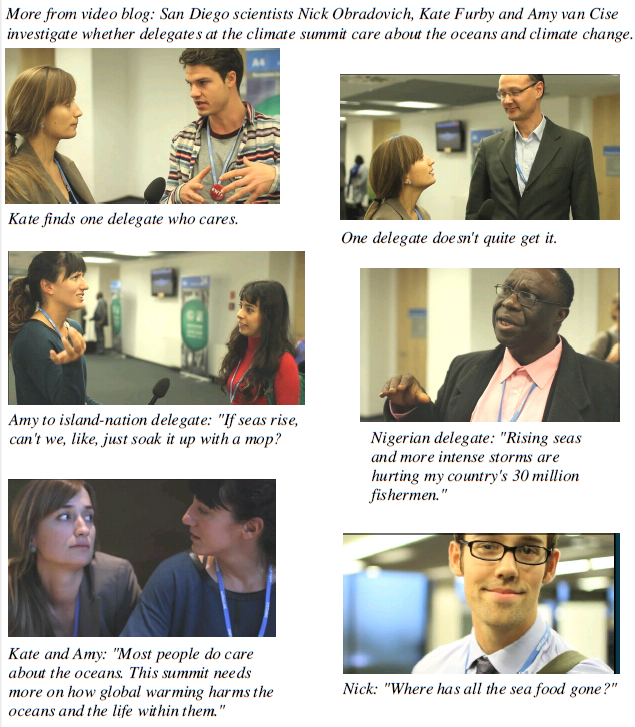 My favorite is “COP 19: Who Cares?” a 5-minute video exploring whether summit delegates care about the oceans. The screen shots at the beginning and end of this post may give you a feeling for how lively and humanly engaged that video is. Their other postings offer interviews with climate protesters on the streets of Warsaw, testimony from summit delegates and ordinary Poles who care about climate, tutorials on how sea life is harmed by little-recognized changes in the ocean’s acidity and oxygen content, and eyewitness assessments of what really happened at the climate talks. Check them out: Ocean Scientists for Informed Policy. Their energy, hope and competence will give you strength to fight for our climate and our children. Photographs and video screen shots by permission of Ocean Scientists for Informed Policy. Blog post researched by Bill Avrin, Bonnie Funk and Janina Moretti. This text by William F. Avrin is used here by permission of the author, and is licensed under a Creative Commons Attribution-NonCommercial-ShareAlike 3.0 Unported License. 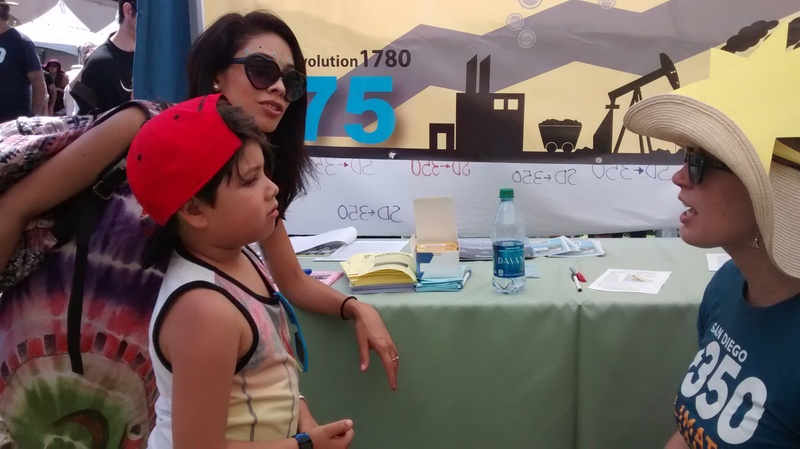 Young San Diego scientists at Warsaw climate summit. Left: Climate policy makers. Center: Scripps scientist Natalya Gallo alerts delegates to ocean’s loss of oxygen. Right: Educating policy makers at ocean science booth. The world’s top climate-policy summit is going on right now in Warsaw, and many of the policy makers there know too little about the actual science of climate change. 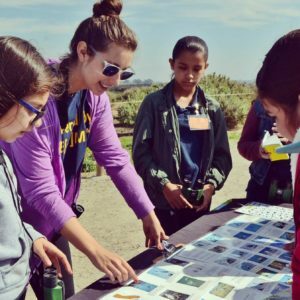 A dynamic group of young San Diego scientists is at the summit to do something about that. Two of them, Amy Van Cise from the Scripps Institution of Oceanography (SIO) and Nick Obradovich from the University of California (UCSD), found time to meet with a few of us from SD350 last week. We were so impressed, we had to let you know about them. 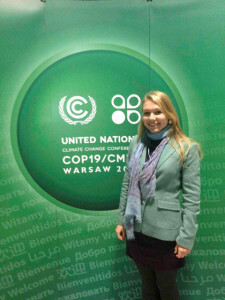 Amy Van Cise (Scripps Insitution of Oceanography) and Nick Obradovich (UC San Diego) are among the young scientists aiming to bring science reality to the Warsaw climate summit. The young scientists, mostly PhD students at SIO and UCSD, are focusing on a crucial area almost unknown to most policy makers: How global warming is affecting our oceans. The oceans cover more than 70% of our planet, absorb a quarter of the heat-trapping carbon dioxide that we are adding to the atmosphere, and take up 90% of the excess heat being trapped in the climate system. In that process, the oceans are warming, getting more acidic and losing dissolved oxygen. Those changes are harming ecosystems, species and fisheries worldwide. Yet, the oceans are almost completely absent from the world’s policy discussions about climate change. 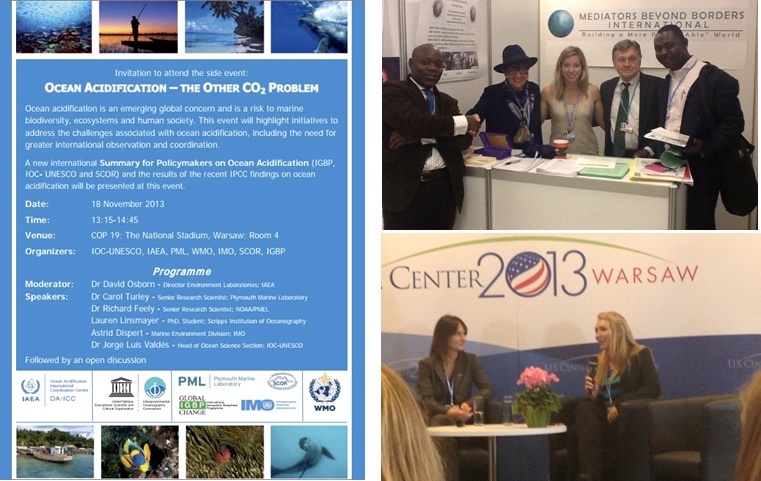 The SIO/UCSD students are in Warsaw to bring key facts about ocean and climate to the 19th Conference of Parties (COP) to the United Nations Framework Convention on Climate Change. Communicating ocean-science reality through formal presentations and informal connections. It’s a tough audience to crack: An invitation-only conference open mostly to governments and big nongovernmental organizations. But, as part of the official Scripps/University of California delegation, the students have rare access to policy makers. They’re taking advantage of that access with an energy that surprised us. Through persistence and force of will, they’ve managed to get two full presentations included in one of the side events that go on at COP. (How they navigated the UN bureaucracy to get those talks included could make a blog posting in itself.) They’re also spreading the word through their booth, and simply by walking up to delegates at the conference, armed with a few carefully honed key messages. What impressed us most was the drive, sincerity and competence of the young scientists themselves. One of us (Bill) knows how tough a science PhD can be, especially at a world-class institution such as SIO or UCSD. We’re amazed they have the energy left over to reach out to policy makers. If Americans in general could meet climate scientists like them, many would get a better sense for how real climate change is. They call themselves Ocean Scientists for Informed Policy. You can see them in action here (click on the gallery on the right), here, here and here. Check them out. They’ll give you hope. Blog post researched by SD350’s Bill Avrin, Bonnie Funk and Janina Moretti. Photos courtesy of Ocean Scientists for Informed Policy.